My Computer Data let's you view various types of computer data from your iPhone / iPod / iPad while on the same WiFi network. Data that is viewed with My Computer Data is automatically stored (cached) on your iOS device and can be viewed later on without requiring any network connection. Use your iPhone / iPod / iPad to remote control PowerPoint presentations on your PC / Mac. 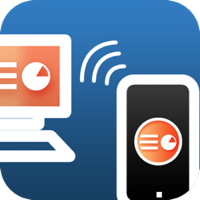 MyPoint for iPhone / iPod touch allows you to remote control PowerPoint presentations on your PC.